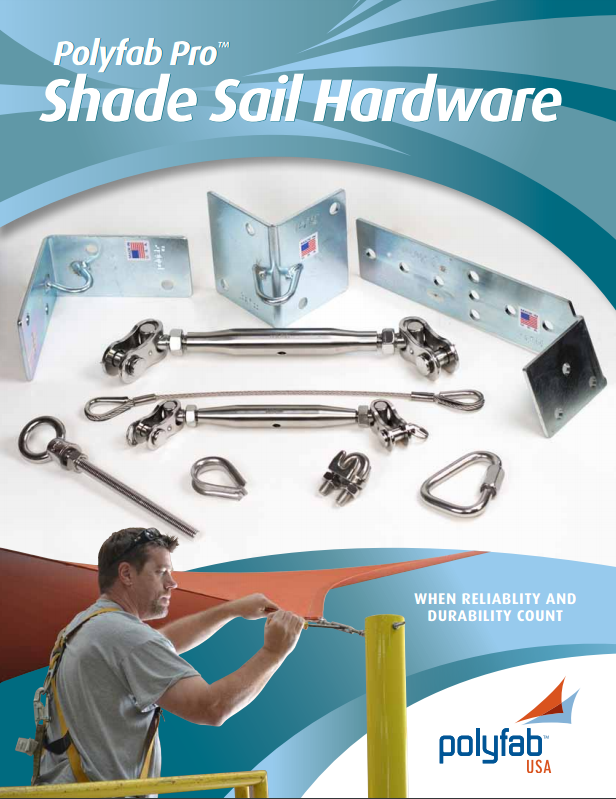 Polyfab ProTM Shade Sail Hardware, which comes from manufacturers of only the highest quality fittings, have been field tested and used by fabricators in Australia for the finest look of their finished shade products. We source these products from established companies in Thailand, Australia and the United States and they are designed to offer the longest life available. That is part of our commitment to the Shade Sail industry from Polyfab USA, “The Shade Cloth People”. 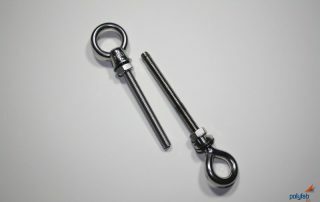 This premium line of marine grade AISI 316/304 stainless steel and other steel hardware is recommended for use in tension shade structures such as hip and ridge and tension membrane shade sails in conjunction with HDPE knitted shadecloth supplied by Polyfab USA LLC, or equivalent quality fabric. The finished structure needs to be properly engineered by a professional engineer and installed by a qualified contractor in accordance with local building codes. It is the responsibility of the fabricator within these parameters to determine the proper hardware for a particular installation. The common rule for keeping stainless steel in its original, pristine condition is to “clean it when it’s dirty”. For regular cleaning start with a soft cloth and clean warm water or use ordinary soap or a mild, diluted detergent or diluted ammonia in warm water; apply with a soft cloth or synthetic sponge. Rinse well, dry with a soft cloth or drip dry. Occasionally the use of a mild household cleaner, a fine synthetic scourer or a brush with nylon bristles may be used. Regular cleaning will often remove heavy soiling and accumulated staining. POLYFAB PROTM SHADE SAIL HARDWARE (“hardware”) is a premium line of marine grade AISI 316/304 stainless steel and zinc-plated steel hardware, which is recommended for use in tension shade structures such as hip and ridge and tension membrane shade sails in conjunction with HDPE knitted shadecloth, or equivalent quality fabric, supplied by Polyfab USA LLC. 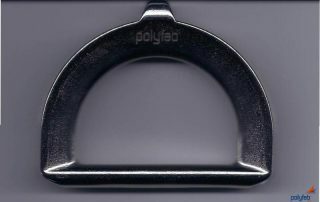 Polyfab USA LLC (“Polyfab”) warrants to the initial purchaser that the hardware will be delivered free of defect from craftsmanship and material at the time of shipment. Polyfab warrants that in normal usage and with proper maintenance, hardware will perform under its specifications for 5 years. 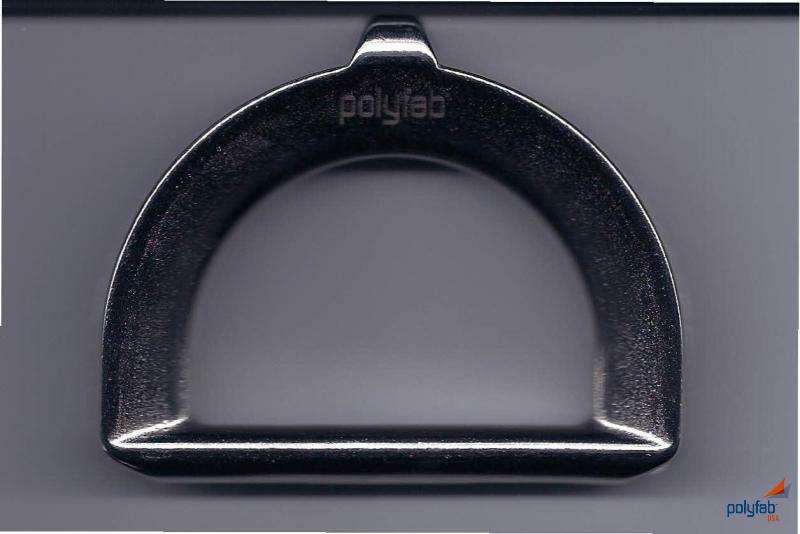 Any hardware which proves to be defective under normal use will be repaired or replaced at Polyfab’s discretion. Polyfab and its distributors accept no responsibility if the hardware purchased is used in applications where the maximum working load listed is exceeded or in cases where hardware is improperly installed. The finished structure needs to be properly engineered by a professional engineer and installed by a qualified contractor in accordance with local building codes. It is the responsibility of the fabricator within these parameters to determine the proper hardware for a particular installation. POLYFAB UNDERTAKES NO RESPONSIBILITY FOR THE QUALITY OF THE HARDWARE EXCEPT AS OTHERWISE PROVIDED HEREIN. THERE IS NO IMPLIED WARRANTY THAT THE HARDWARE SHALL BE MERCHANTABLE. POLYFAB ASSUMES NO RESPONSIBILITY THAT THE HARDWARE WILL BE FIT FOR ANY PARTICULAR PURPOSE FOR WHICH YOU MAY BE BUYING THE HARDWARE, EXCEPT AS OTHERWISE PROVIDED HEREIN. THERE IS NO IMPLIED WARRANTY THAT THE HARDWARE SHALL BE FIT FOR ANY PARTICULAR PURPOSE. YOU ACKNOWLEDGE THAT YOU ARE NOT RELYING ON POLYFAB’S SKILL OR JUDGMENT TO SELECT OR FURNISH THE HARDWARE SUITABLE FOR ANY PARTICULAR PURPOSE AND THAT THERE IS NO WARRANTY WHICH EXTENDS BEYOND THAT PROVIDED HEREIN. Exposure to pollution, chemicals, solvents, cleaning agents or other substances that are harmful to the performance of the hardware. 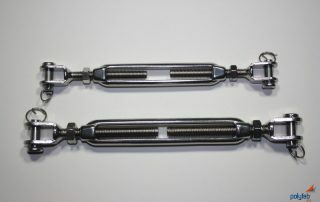 Faulty installation of the hardware or faulty design or manufacture of any structure to which the hardware is attached. 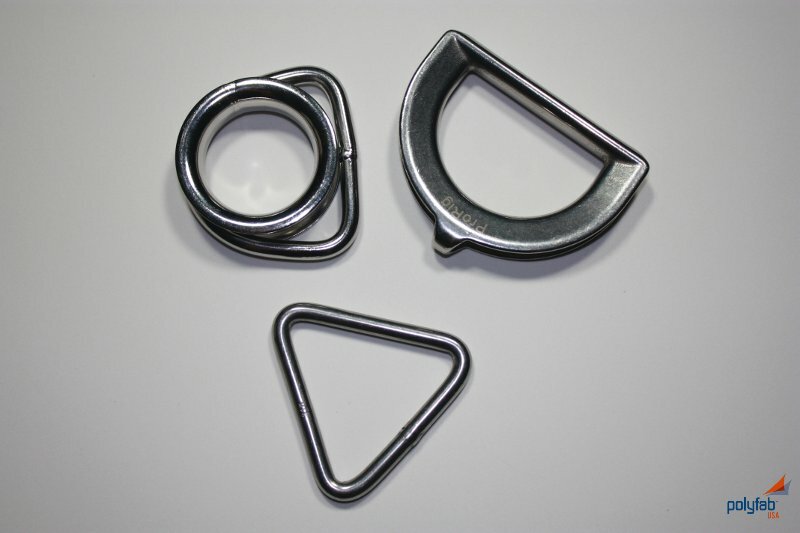 Improper storing, handling, bracing, use of the hardware or use contrary to the specifications for the hardware. Misuse, neglect or abuse of the hardware. 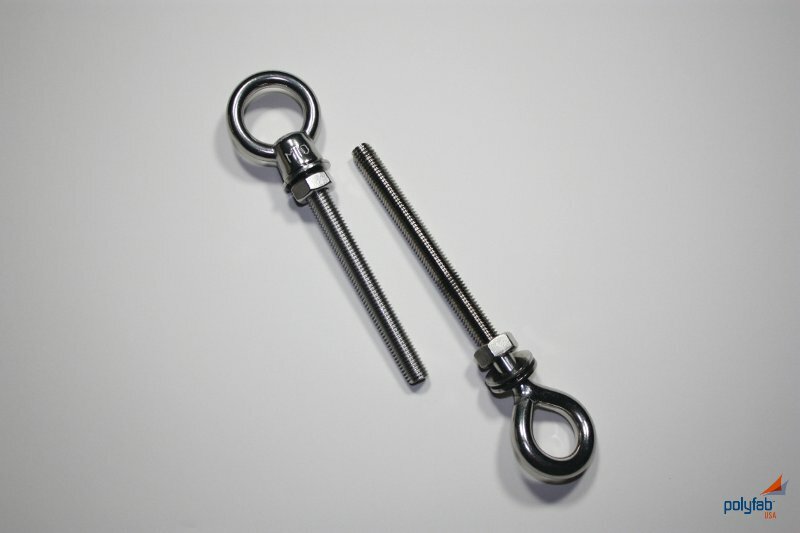 It is recommended than an anti-seize compound be used on all threaded connections to avoid “thread galling”, or the binding of threads under load. This condition, though lessened, is still a possibility especially if overloaded. This is the nature of stainless steel and is not considered a defect, and Polyfab is not responsible if this occurs. Another trait of stainless steel is called “tea staining”, a discoloration in a corrosive environment (salt water and chlorine). 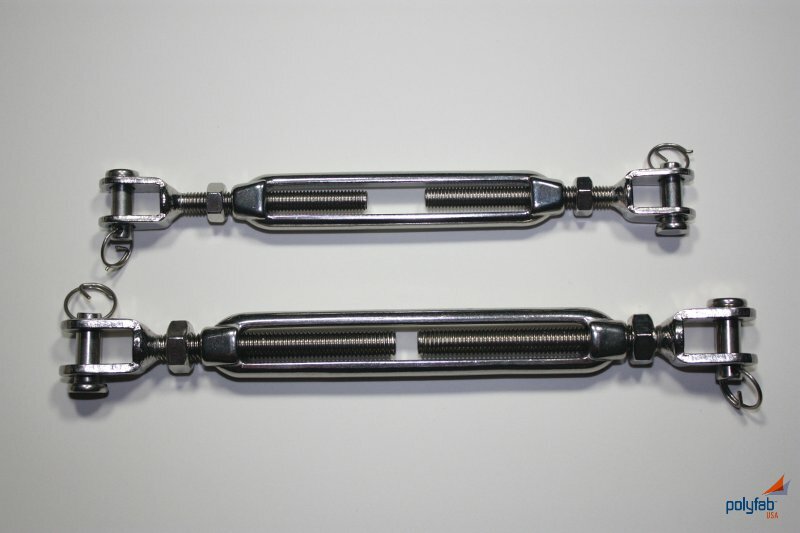 This is not a reflection on the quality of the stainless—a regular cleaning program can reduce this. This is the nature of stainless steel and is not considered a defect and Polyfab is not responsible if this occurs. Polyfab’s obligations and liabilities are expressly and exclusively limited to those set forth herein. POLYFAB SHALL NOT BE LIABLE FOR DIRECT, INDIRECT, INCIDENTAL, CONSEQUENTIAL, OR SPECIAL DAMAGES, INCLUDING LOSS OF PROFITS, OR OTHER COMMERCIAL LOSS, AND INCLUDING CLAIMS BASED ON NEGLIGENCE OR STRICT LIABILITY, EXCEPT AS OTHERWISE PROVIDED FOR HEREIN. NOTWITHSTANDING THE FOREGOING, ANY LIABILITY RELATED TO THE HARDWARE SHALL BE LIMITED TO THE PURCHASE PRICE OF THE HARDWARE. All claims must be made in writing, within 30 days from the date upon which the defect became known, to Polyfab USA LLC, 1601 N. Sepulveda Blvd. #392, Manhattan Beach, CA 90266. Claims must be supported by a sample of the defective hardware together with proof purchase, including the date and location of hardware purchase.